Here’s a neat video I recently came across. It shows the vocal folds of four singers simultaneously while performing Hear Us and Have Mercy. I’m not sure who the composer is. Beautiful piece, though, and well performing – especially considering they had a scope down their noses while singing. There are many similar videos up on YouTube that show the vocal folds while a musician is performing, not just singers. Here’s one of an oboist who was having voice problems because she was closing her vocal cords while playing. It would be interesting to look at brass players while performing. I would suspect that the more experienced players would have a very open voice box while playing, or at least this is what we tend to teach. That said, no one has actually looked to see if experienced brass musicians actually do this or not. What we think we do doesn’t always reflect reality. I came across this puzzle canon the other day. Take a look at the following melody and try to come up with the proper place and interval to begin the repeat so that it creates a canon with no “dissonant” intervals (no 2nds, 4ths, or 7ths) and no “incorrect” voice leadings (no parallel 5ths or octaves). 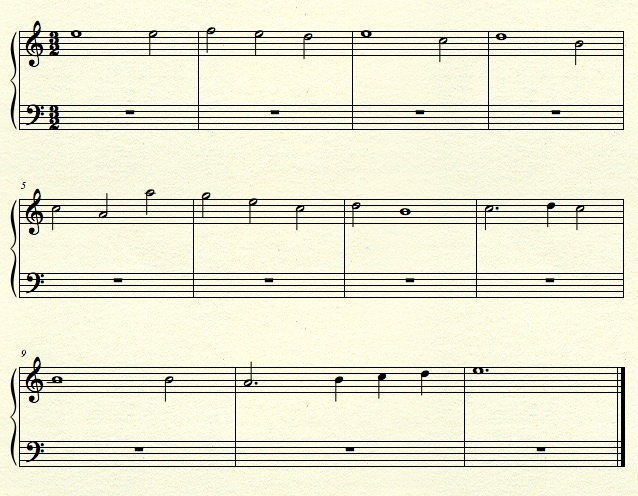 Here is a PDF version of this melody if you want to try to work it out a bit. One hint to help you is that the second voice doesn’t enter at the pitch E, but rather a diatonic (no accidentals) transposition starting on a different pitch. See if you can figure it out. My solution after the break. Drop the Needle – Answer to last episode’s contest. Submit your answer for this episode through my contact form. Happy Labor Day to all the readers from the United States. To help everyone celebrate their day off from work, here’s Cannonball Adderley’s Quintet performing Work Song on Jazz Scene USA in 1962.